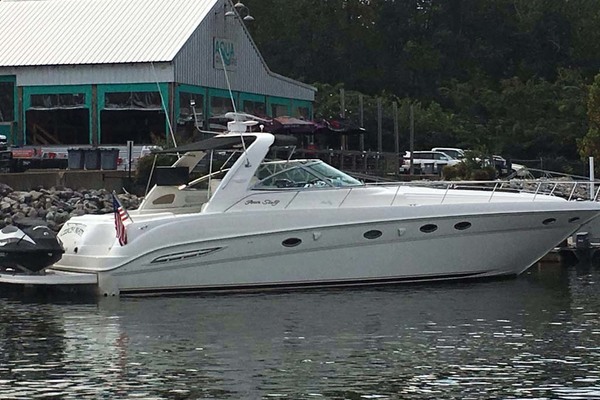 Professionally maintained vessel positioned to be the next 50 Sundancer sold! 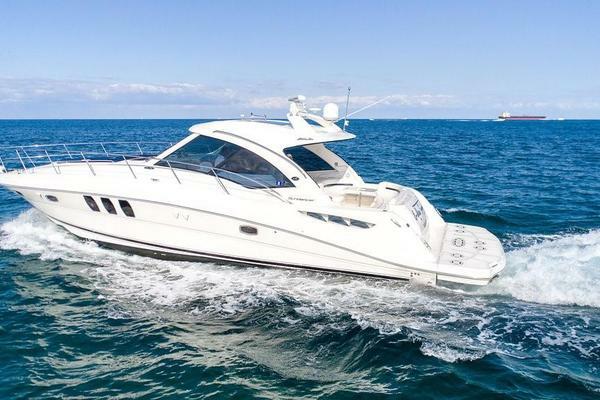 A few of the notable options included on this vessel are as follows: Twin Cummins Zeus QSC 550's, DSS SAT TV, Retractable Electric Sunroof, twin Raymarine E-120's with GPS/plotter/radar, cockpit A/C, teak flooring upper cockpit, cockpit refrigerator, underwater lighting, hydraulic swim platform, sunpad forward deck with backrest, spotlight with dual halogen bulbs, vacuum system, washer/dryer combo, wood flooring salon, galley and forward stateroom, cockpit drop curtain, Upgraded LCD flatscreen TV/DVD cockpit, Salon, staterooms and much more..
Easy to see in our marina, make an appointment today! 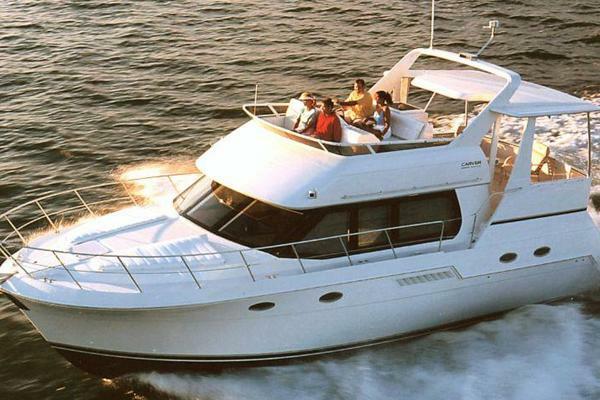 The gorgeous curves and aerodynamic profile of the 500 Sundancer are sure to attract attention. Outfitted with a unique, electric windshield vent system that allows for an unbroken line from deck to roof plus a sleek hardtop with two extra-large sunroof hatches, this ingeniously designed beauty is nothing short of inspired. Board the 500 Sundancer from the oversized hydraulic swim platform. Access the cockpit through the port side transom door. Immediately to port is the cockpit grill with a refrigerator underneath. A countertop is next to it that features a stainless-steel sink and a TV on top of it for entertainment. To STBD is a J-shaped seating complete with teak cockpit table. Moving forward, to port is a very comfortable oversized lounger. Located in the forward STBD portion cockpit is the helm station equipped with electronics such as twin Raymarine E120, Mercury Precision Pilot, Zeus joystick drive system, and Mercury SmartCraft gauge. It has the upgraded captain's seats that you can adjust to your desired position. Centerline to port forward, there are 5 teak tread steps leading down to the oversized salon. To STBD is the L-shaped sofa with pull-out bed, storage cabinets, and entertainment center located in the aft portion of the salon. It is equipped with MP3 port, Bose lifestyle DVD player, and flat screen TV (mounted on upper cabinet for better viewing/storage). To port is the galley with lots of great storage. It offers solid surface countertop with stainless steel sink, wood galley flooring, single lever faucet, Norcold refrigerator, and Sharp Convection Grill 2 convection oven. Both the port and the STBD sides have oversize port lights with blinds. The entire area is outfitted with recessed lightings. Entry to the VIP stateroom is via a solid door in the aft port corner of the salon. The main distribution panel is located to port just before entering this stateroom. The VIP features (2) single berths (that can be pushed together to make a double berth), hanging locker with lights and shelves, port light, air conditioning unit, a vanity with sink and nice storage line the port side of this stateroom, and a head with shower are located all the way in the aft port corner of the stateroom. From the galley/salon area, forward is the master stateroom. It has a double berth, storage lockers, mirrored head board, entertainment center, port lights, sun roof with cover, and side lights. This stateroom offers a split head. To port is the head with VacuFlush, stainless steel sink, and vanity storage while to STBD is a large shower. Standard SmartCraft® Instrumentation and VesselView. Optional Zeus pod drives with 360° Control helm joystick. U-shaped seating with storage below. Large transom storage with gas-assist lid. Standard 26" LCD flatscreen TV with remote DVD player in salon. Standard Ultraleather HP™ interior seating. Swim platform with concealed ladder. Standard hardtop with overhead lighting and two large opening sunroof hatches. Optional recessed forward deck sun pad. Standard 240v/50 Amp shore power with convenient Glendinning cablemaster. Shore power and water inlets concealed in transom storage. Patented underwater exhaust for quieter cruising. Insulation, Engine Room - 2"